Star & Co Chartered Accountants and Business Advisors had recently commissioned a new branding design and wanted to review their website to ensure it was consistent with their positioning. Most of Star & Co's business comes through referrals, so one of the key objectives of the website was to ensure that their reputation and status in the industry was reflected in the website. Additionally, Star & Co wanted their time-poor clients to quickly and easily find their contact details, so financial advice was a hassle-free phone call away. With a boutique business that deals with high net worth groups and individuals, and who are experts in their field, then you have to bring your A game. An extensive competitor analysis was completed on similar boutique businesses in both Australia and the key overseas financial markets of London and New York. This work helped inform the content strategy where clear messaging was presented with sufficient whitespace to avoid overwhelming current and potential clients. Vivid. A website that compliments the high net worth of the business, staff, clients and location. 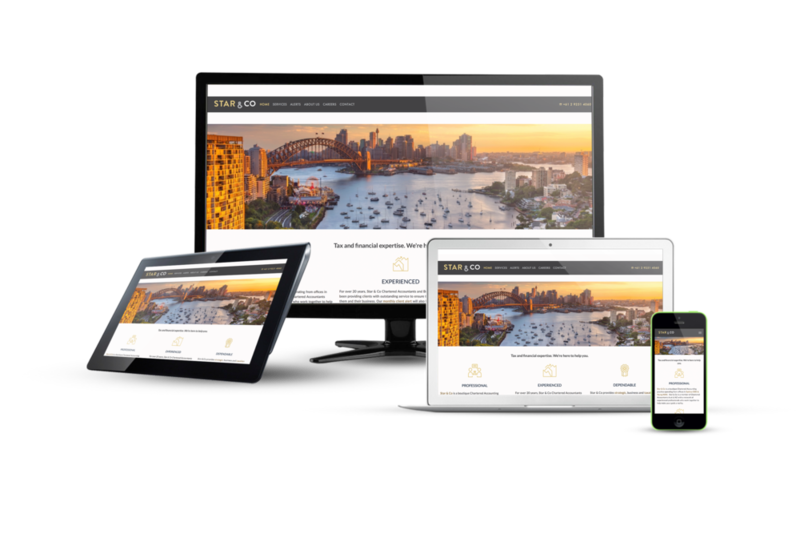 Every image used on the Star & Co website complimented the new branding design palette with golds and bronzes binding the vivid imagery which represented spaces and places throughout Sydney and NSW. Each image that represents the Star & Co services was carefully chosen to represent, in sometimes very subtle ways, the outcomes that Star & Co clients want. The business originated in Young, NSW where Star & Co still have an office, with the Sydney operation located in the heart of the CBD. It was important for Judy and the team that the business maintained it's links to their core country values whilst embracing the benefits and culture of Australia's largest city. This was reflected in the voice and and imagery of the website. One of the ways was to include a landscape photo of Young taken by Sally who manages the Young branch. The website is protected by a certificate so clients see the padlock symbol in their browser and can feel safe and secure from the moment they connect with Star & Co. With current versions of browsers making it glaringly obvious which websites are secure and which are not, and with Google ranking secure websites higher, this was an essential feature to include.